The Oculus Rift and the PlayStation VR are virtual reality headsets that transport gamers into an immersive world. If you’re unfamiliar with the virtual reality space, we narrowed down the field for you by comparing these two devices that have generated a lot of buzz lately. The PlayStation VR is available for preorder, and the Oculus Rift is on sale now. Both will be shipped later this year. But which one of these pricey, futuristic-looking headsets should you splurge on? If you’re a PlayStation 4 user, you might be eyeing the PlayStation VR, which offers a seamless experience with the platform. But PC gamers who are excited to play more indie and experimental games will be best served by the Oculus Rift, which started out as a Kickstarter campaign and was bought by Facebook in 2014 for about $2 billion. Read on to find out more about each of these VR headsets. What we found: The Oculus Rift and the PlayStation VR are both immersive headsets tailored for use with video games. The Rift requires a Windows PC connection in order to operate (download a Rift compatibility tool from the product’s website to see if you’re equipped); the VR requires a PlayStation 4. What you’ll learn: The introductory PlayStation VR Core Bundle is $200 less expensive than the Oculus headset, but there are still extras left to buy for both products. On the outside, these devices look fairly similar. Each is a bulky and rather futuristic-looking pair of goggles that users wear over their eyes and strap around their heads. 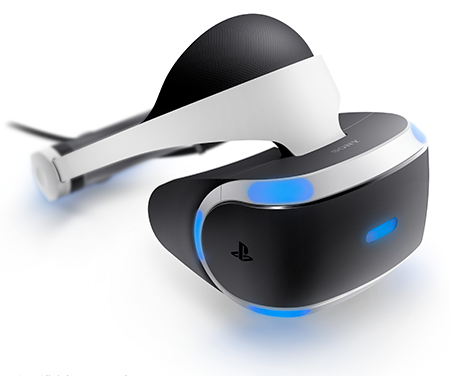 The Oculus Rift is all black, whereas the PlayStation VR is a combination of white and black with blue LED lights. The VR is arguably a little sleeker than the Rift, with its components packed into the top of the headset, rather than on the goggles like the Rift. The Oculus Rift has a remote (with navigate, home, back, select and volume controls) and an integrated VR audio system that fits over the ears. It comes with an Xbox One wireless controller and a sensor tracking system on a stand that should be positioned in front of the user. The PlayStation VR Launch Bundle comes with a DualShock 4 wireless controller, PlayStation Move motion controller and a PlayStation Camera to track movements. The camera captures user movement by following LEDs on the device’s headset and controllers. The Core Bundle comes with only the headset. You don’t need the Move controllers to use the VR, but you do need the camera, so take that into consideration when choosing which bundle to buy. Not only do they look similar, but these virtual reality devices offer similar experiences, too, by letting users feel like they’re actually part of a video game. To do this, the headsets feature tiny video screens in front of your eyes, and outside cameras track user movements, for a fully immersive experience. The Rift has two 1080×1200-pixel OLED displays, a 90Hz refresh rate and a 110-degree field of view. It has 8GB+ RAM memory, three USB 3.0 ports and one USB 2.0 port. The device requires a compatible PC in order to operate. The VR offers 960×1080 pixels per eye at a 120Hz refresh rate, with a 100-degree field of view. It’s powered by being plugged into a PlayStation 4 gaming console. Overall, in terms of specs, the Rift provides a little better virtual reality experience, but for many users, the differences won’t be too noticeable. PlayStation has a ton of VR games on the horizon, according to IGN, but release dates for most have not yet been announced. The Rift has already launched 30 Oculus games, with at least 10 more coming soon. Launched games include: “Dreadhalls,” “ADR1FT” and “Radial-G.” Players can check the Rift Arcade to find a collection of third-party launch games as well as upcoming releases. The Oculus Rift has an estimated ship date of July 2016, but it’s available for purchase now (limit of one per customer) for $599. You’ll receive the following: sensor, remote, cables, Xbox One controller and two games (“EVE: Valkyrie” and “Lucky’s Tale”). The PlayStation VR Headset Core PS VR Bundle (headset, processor unit, stereo headphones, demo disc, cables) has an October release date, but can be preordered for $399. Note that the PlayStation 4 and PlayStation Camera are sold separately from this bundle. The PlayStation VR Launch Bundle ($499.99) is also available for preorder. It includes the standard bundle components as well as PlayStation camera, two Move motion controllers and the PlayStation VR Worlds game disc. Here, too, the PlayStation 4 is sold separately. Die-hard gamers likely already have their eyes locked in on one of these devices (and their preorders already placed), but for everyone else, both of these devices offer an appealing entertainment experience. So your decision will likely come down to gaming preferences and cost. If you’re already in the PlayStation ecosystem, the PlayStation VR seems like a natural fit. Similarly, if you’re a PC owner, the Oculus Rift can be an exciting add-on to your technology collection. If you don’t own either a PC or a PlayStation 4, you could be facing quite an investment to get yourself equipped. In this case, you’ll want to weigh the total cost (gaming platform or computer plus virtual reality headset). Courtney Jespersen is a staff writer at NerdWallet, a personal finance website. Email: courtney@nerdwallet.com. Twitter: @courtneynerd.